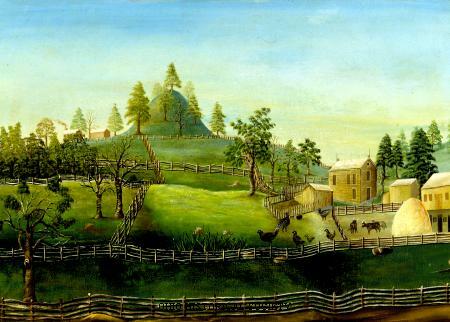 Painting of the Miamisburg Mound in Montgomery County, Ohio with a view of a farm, farmyard and animals including chickens painted by Charles Sullivan, ca. 1835-1860. The Miamisburg Mound is the largest conical burial mound in Ohio and possibly in the eastern United States. It was likely constructed by the prehistoric Adena Indians (800 B.C.-A.D. 100). Charles Sullivan studied art in Philadelphia and moved to Marietta, Ohio in 1833. Landscape paintings were his specialty. He produced numerous paintings of the river area of southeastern Ohio and what is now western West Virginia. Sullivan lived in Marietta until his death in 1867 at the age of seventy-three. This painting is part of the fine art collections of the Ohio Historical Society.